Tidewater Community College celebrated student success and women’s leadership during the 14th annual Women’s Leadership Breakfast, hosted by the college’s Women’s Center. 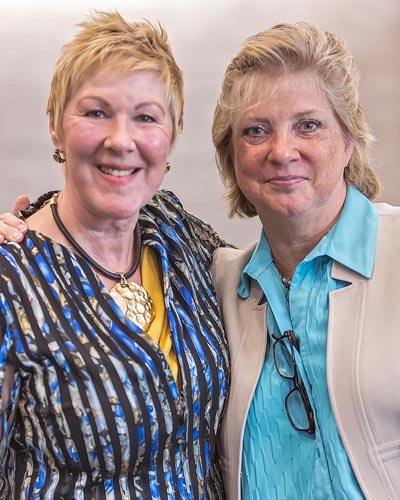 “With your support, one in every four students was reached through direct services and there were over 200 educational programs aimed at empowering women,” said President Edna Baehre-Kolovani as she welcomed guests. 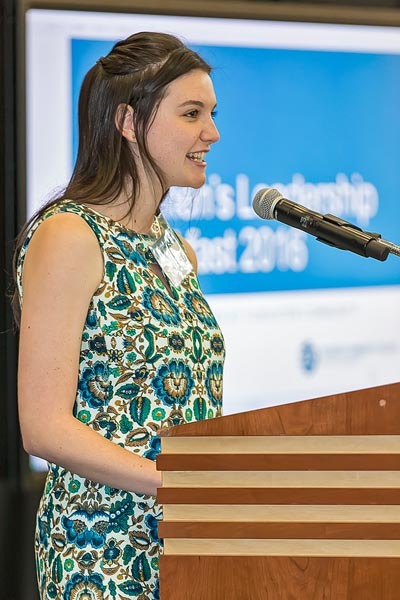 Elisabeth Barth was selected as the 2016 Mary Pat Liggio Student Leadership Award recipient, named for the founding coordinator of the Women’s Center. Barth graduated with an Associate of Science in Social Sciences and holds a 4.0 GPA. She is a graduate of the Women’s Center’s leadership development program and served as vice president of membership for TCC-CARES. “While I had intended to keep my head down and move quickly through community college, TCC had other plans for me. I was able to break out of my shell, aided by a nurturing and encouraging staff, taught by thoughtful and knowledgeable professors,” Barth said. Barth was also a member of the Student Government Association (SGA) and secretary of the SGA Federation Council. A Chesapeake Campus student ambassador, Barth completed the Gear Up to Lead program. She is pursuing her bachelor’s degree in elementary education. TCC student Kossiwa Amevor and four others received the Dr. Alexsandria Manrov STEM award. Amevor earned an Associate of Science in Science and a 3.966 GPA. She plans to pursue a bachelor’s in biology, with a minor in public health. Her dream is to attend medical school and work as a physician for a medical charity. Hieu Hau graduated with an Associate of Science (Specialization in Computer Science) and a 3.95 GPA. Hau plans to transfer to Old Dominion University to pursue a bachelor of science with an emphasis in cyber security. She hopes to one day join the military. Nadine Naser graduated with an Associate of Science in Engineering and a 3.74 GPA. She plans to transfer to Old Dominion to pursue her bachelor’s in engineering. Nhi Pham earned an Associate of Science in Science and a 3.86 GPA. She plans to pursue her bachelor of science in dental hygiene and focus on oral diseases. During the 2015-2016 school year, more than 10,000 students at TCC participated in programs or received services from the Women’s Center. The Women’s Center collaborated with campus and community partners for over 200 programs on topics ranging from leadership and professionalism to personal safety and healthy relationships. In addition, 65 students received more than $6,000 in emergency assistance funds that were determined by Women’s Center staff to be critical to the retention of these students. To address hunger on campus, the center also provided $500 for students to put on their student ID cards to access dining resources in campus cafes. Dominion Virginia Power was the presenting sponsor of the 2016 Women’s Leadership Breakfast. “Dominion is pleased to sponsor the Women’s Center, whose mission is to educate, empower, enhance, and engage women as well as create a campus culture of diversity and inclusion that so closely aligns with Dominion’s mission to strengthen our communities through leadership and diversity” said masters of ceremonies, Bonita Billingsley Harris. Other sponsors were Dollar Tree, Farm Fresh Food & Pharmacy, Pender & Coward: Attorneys and Counselors at Law, Towne Bank, WillowOak Center for Positive Change, Monarch Bank, Noah Enterprises, Top Guard Security, and Wilbanks, Smith & Thomas Asset Management. Flowers for the event were donated by The New Leaf.